Would You Make A Frankenpen? I have a silver Tiffany ringtop that had breather holes drilled into the section...a failed experiment, I suspect. The only way to stop it from leaking ink onto my fingers was to wrap medical tape over the holes. It’s a really good pen, and I suppose a jeweler might be able to plug the holes, but so far so good. I tecently bought a beautiful first generation Sonnet sterling silver fuogere (or whatever the name of the finish) with the double gold rings on the section and a two tone 18k M nib for a very good price (PKR 6500 = $60 approx) because some illiterate former owner who couldnt read or may be couldn't understand the 925 stamping on both the cap and the barrel put a two mm long cut on the cap ostensibly with a sharp knife and probably with the intent to ascertain as to what the metal used was. I was, however, able to get the cut filled by a skilled local silversmith without disturbing the pattarn/finish of the pen. So hopefully the pen is not a frankie now. I have a Noodler's Konrad in Red Mesa Tortoise, that had the original nib taken out and replaced with a Goulet branded Jowo Broad. Closest thing I currently have to a Frankenpen. 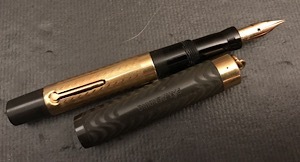 Until I got the new section and barrel for the 45 that went through the wash, if I wanted to use that pen I had to steal a barrel from another 45. At times it looked like a FLighter with a burgundy section. Now as a forest green it looks great. That could pass for an original... the cap and barrel have a similar wave pattern... and Pelikan is known for their black caps. That was my first "frankenpen,"... but mine was an Ahab with a Goulet/JoWo nib. So far, I cannot recall making any other's. So, guys, I guess you would say almost all of my pens are Frankenpens. (Made by Al Franken?) I routinely use Goulet 1.1 mm nibs in Nemosine, Noodler Konrands and Ahabs, Monteverde, etc. And sharpen Broads and Mediums into italic nibs. But some are more franken than others. Latest fun group are the Wing Sung 3008's. Now, a Wing Sung 3008 may be had for as little as $2.00 if you are willing to wait a month for shipment from China. The pen is a direct knock-off of the TWSBI 580, except for the feed/nib assembly. That is an installed feed with Lamy rubber ridges, so that Lamy nibs (the Safari/Vista/Studio/et al nibs) may be used on the pen. As with most Chinese-made pens, the 3008 is usually sold with a fine ball nib. Since I use italics almost exclusively, that means an italic nib. There are two ways to get an italic nib on the pens. First, cut the original fine to an italic form, and smooth it out. Works well, did that to a few of my 3008s. Next is to acquire a Lamy 1.1 nib that is homeless and install it on a 3008. Did that with a Lamy Medium that had been converted into an italic fine nib. Oh, and a third way to go: Buy a slew of 1.1 mm nibs from China. They come with a very light stamp that says "Lamy 1.1 mm" on the body of the nib. Definitely made in China, sell for around $2.00 each. Have several, they are working as well as the Lamy originals. That's the real laugh about the Wing Sung 3008: A little time spent waiting, a little time spent working, and $4.00 spent -- for a pen that writes as well as any I own. Looks lovely, the clear demonstrator barrel has a lovely crystal look about it. Edited by Randal6393, 28 January 2018 - 22:18.